Synthetic peptide conjugated to KLH derived from within residues 1000 to the C-terminus of Human CRM1. ab24189 gave a positive result in HeLa whole cell lysate. This antibody also gave a positive signal in IHC in human hippocampus tissue sections. Our Abpromise guarantee covers the use of ab24189 in the following tested applications. WB Use a concentration of 1 µg/ml. Detects a band of approximately 100 kDa (predicted molecular weight: 123 kDa). Abcam recommends using 3% milk as the blocking agent. Mediates the nuclear export of cellular proteins (cargos) bearing a leucine-rich nuclear export signal (NES) and of RNAs. In the nucleus, in association with RANBP3, binds cooperatively to the NES on its target protein and to the GTPase RAN in its active GTP-bound form (Ran-GTP). Docking of this complex to the nuclear pore complex (NPC) is mediated through binding to nucleoporins. Upon transit of an nuclear export complex into the cytoplasm, disassembling of the complex and hydrolysis of Ran-GTP to Ran-GDP (induced by RANBP1 and RANGAP1, respectively) cause release of the cargo from the export receptor. The directionality of nuclear export is thought to be conferred by an asymmetric distribution of the GTP- and GDP-bound forms of Ran between the cytoplasm and nucleus. Involved in U3 snoRNA transport from Cajal bodies to nucleoli. Binds to late precursor U3 snoRNA bearing a TMG cap. Several viruses, among them HIV-1, HTLV-1 and influenza A use it to export their unspliced or incompletely spliced RNAs out of the nucleus. Interacts with, and mediates the nuclear export of HIV-1 Rev and HTLV-1 Rex proteins. Involved in HTLV-1 Rex multimerization. Expressed in heart, brain, placenta, lung, liver, skeletal muscle, pancreas, spleen, thymus, prostate, testis, ovary, small intestine, colon and peripheral blood leukocytes. Not expressed in the kidney. Belongs to the exportin family. Cytoplasm. Nucleus > nucleoplasm. Nucleus > Cajal body. Nucleus > nucleolus. Located in the nucleoplasm, Cajal bodies and nucleoli. Shuttles between the nucleus/nucleolus and the cytoplasm. This blot was produced using a 4-12% Bis-tris gel under the MOPS buffer system. The gel was run at 200V for 50 minutes before being transferred onto a Nitrocellulose membrane at 30V for 70 minutes. The membrane was then blocked for an hour using 3% milk before being incubated with ab24189 overnight at 4°C. Antibody binding was detected using an anti-rabbit antibody conjugated to HRP, and visualised using ECL development solution. ICC/IF image of ab24189 stained HeLa cells. The cells were 100% methanol fixed (5 min) and then incubated in 1%BSA / 10% normal goat serum / 0.3M glycine in 0.1% PBS-Tween for 1h to permeabilise the cells and block non-specific protein-protein interactions. The cells were then incubated with the antibody ab24189 at 1µg/ml overnight at +4°C. The secondary antibody (green) was DyLight® 488 goat anti- rabbit (ab96899) IgG (H+L) used at a 1/250 dilution for 1h. Alexa Fluor® 594 WGA was used to label plasma membranes (red) at a 1/200 dilution for 1h. DAPI was used to stain the cell nuclei (blue) at a concentration of 1.43µM. IHC image of CRM1 staining in Human normal hippocampus formalin fixed paraffin embedded tissue section, performed on a Leica Bond™ system using the standard protocol F. The section was pre-treated using heat mediated antigen retrieval with sodium citrate buffer (pH6, epitope retrieval solution 1) for 20 mins. The section was then incubated with ab24189, 5µg/ml, for 15 mins at room temperature and detected using an HRP conjugated compact polymer system. DAB was used as the chromogen. The section was then counterstained with haematoxylin and mounted with DPX. 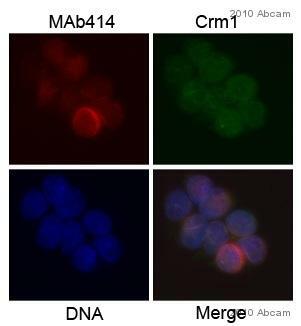 ab24189 detects a band of ~ 100 kDa in HeLa whole and HeLa nuclear cell lysates. This is somewhat smaller than the predicted band size according to Swissprot (123 kDa), however as both these bands are specifically blocked by the addition of the immunizing peptide (ab25749) we believe they represent CRM1. Publishing research using ab24189? Please let us know so that we can cite the reference in this datasheet. We are looking for a CRM1 antibody and a control IgG for IHC in FFPE slides. I found three CRM1 antibodies on your website (ab24189, ab77977, and ab84375). Could you please recommend which antibody is the best for IHC? I plan to use it for tissue array.